The Time Scale of Word of Mouth - What's the Shelf Life of Your Buzz? Some of these things are not like the other. Yes, word of mouth-based strategies and tactics have a much different burn rate. Some people believe that word of mouth is not a campaign or short term thing. Others believe that word of mouth can't be sustained and thus it's confined to being used as a short-term tactic focused on being noticed and talked about for a short interval. I happen to disagree with both of these hardline positions. Depending on what you want out of your people-driven marketing, each may have a role. I'll share with you instances where each may apply below. So as the women bar owner in the Blue Brothers movie responds to the question- "so what kind of music do you have here? Oh we have both kinds, country and western". I find word of mouth is considerably more discriminating and variety-driven. I've usually taken a diplomatic tact when dealing with the traditional-minded world of media, marketing and research people but c'mon, enough is enough....if you can't be startled and motivate to act by a feather to the soles of your feet than maybe you need a blunt force blow to the head. Trust me - from one who has spent tens of millions dollars on advertising and mainstream marketing in his lifetime, you are peddling fool's gold. The same people who believe a recession couldn't happen are the same ones ascribing increased sales to increased media weight - insanity. Wake up. Campaigns rarely if ever build brands anymore, price-offs don't build sustainable consumption, shackling yourself to a brand identity manual is "paint by numbers" marketing that denies the reality of what has happened in the last decade to your consumer, marketplace and culture at large. Ask anybody under 27 years old in your department, they will tell you the harsh reality of what's happening - are you prepared to listen? With the remote, expansion of channels, PVR, simultaneous multimedia consumption - I would evaluate a TV GRP being 20% of the benefit it was ten years ago. Plus it's at least twice as expensive. Radio and newspapers are a dying game and whereas I have a lot of heart for well-produced and targeted magazines, who wants to read about stuff that is weeks old in a 24/7 game. I don't mean to add insult to media injury - there are some fine journalists and media people out of work right now...but the model is irrevocably broken and not coming back. The idea of companies renting out space and being viewed as an interruption to the good content is a horribly outmoded concept. Even on captive mediums, the communication is all wrong. Very few stop me in my tracks, provoke me to do something or invite me to learn more. I guarantee you if you drive past 20 billboards today and if one even gets you to think about the product being advertised, I would be surprised (yes, I know it's snowing but you should still be able to see them). We hate the bravado, don't trust the promise and likely worse, simply don't care about the entire impersonal selling approach. Join the real game and stop watching the scoreboard. Although it may lack standards, be slow to scale, be apparently risky, may deny some of your strategic genius and require a new set of skills, word of mouth and all its different variants is the real deal. The Canadian marketing groups across this country will spend $20 billion in media next year. We have trained a generation of marketers and advertisers not to rethink the equation- I guarantee ahead of time - most of their efforts will be wasted, that is a given. The big question is what are YOU going to do about it? Good pickup by Andy Sernovitz on Jamie Oliver's quest to healthify the U.K. (they still fry chocolate bars there, don't they?). I would also mention that the site succeeds by providing well-laid out supoporting information in a blog-style format, use of documentary video in context and mastery of the repeatable idea "Ministry of Food", "Pass it On" and "Get the Country Cooking Again". Jamie - well done chap, heaven knows this needs to be that good - with trans-fatty crisps, big brewed ales and steak & kdiney pie as staples, you have a big challenge ahead of you. Three weeks since by last post, shame on me...any blogger worth their salt knows that 3 per week is the absolute minimum to maintain the ADD-riddled world of social media attention. My only excuse...we've been busy starting some fires for the holiday season and next year...for the listing of Wildfire developments and the occasional shameless self-promotion see below. If you are an enthusiastic outgoing person in any of these areas, please let us know and we would love you to join our efforts in some capacity. Give us a call, get the details by signing up for our Buzz Report or join our media/PR tour in October/November. Category-exclusive opportunities await. We are relaunching our Agent Wildfire and Influencer sites to add more functionality and design appeal. We are also going to be launching the beta of something called Influencers in The Know next month - a hybrid of influencer content and RSS aggregation of only the leading edge content on the web specifically designed for Canadians. We are interested in grassroots celebrities and influencers interested in sharing us their top 10 sites/blogs for the best edgy content - let us know. If you are to use Sarah Palin's words "mavericky" and Obama's words "say YES WE CAN to client opportunities" and McCain's words "want straight talk in marketing" and Biden's words...what does he say anyway?....send us your best attempt to get noticed and talked about through the stack of resumes - apologize in advance if we don't always get back quickly. We are also hatching a League of Kickass Network event hopefully for November. I'm quite excited about this as we wrangle a name brand author and CEO to take the gloves off in debate . If you're a senior marketer, media, business executive or digital geek and you are suitably Kickass give us a shout and let's get you on the list. We will be hosting a road trip across cities Marketing 2.0 for the Executive - a conversation-worthy, safe haven overview for executives willing to embrace this arena but not knowing where to go next. We are about the finalize our white paper on "Word of Mouth Marketing 2009" - a check in on marketer attitudes and beahviours with WOM, launch our presentation and start our community-based white paper "It Takes a Community to Build a Brand". I'll also personally be participating in Marketing Week events and hosting a panel of 6 experts on social media...yikes...look forward to some dust ups, insight and some "keeping them honest" Anderson Cooper like moderating in that one. And in other predictions - Obama wins by 7 pts, Harper gets in by a slim minority, Green Party breaks past 11% of popular vote, Red Sox win the Series again (yeah! ), The TSE bottoms out at 8.500, Leafs win only 24 games this year and retail sales will drop 6% year over year at Christmas (bah humbug!). So our silence here has not been without productive distraction...apologies to Buzz Canuck Nation - we'll try to let it happen again. For many of you who have seen me speak at conferences, you may recall I dedicate my first presentation slide to a some type of social, word of mouth-worthy cause that deserves our collective attention. For a long period of time, my fave was Kiva. Why? Partly because of its altruistic mission, party because of its micro-financing success and partly because it excites the donor just as much as the donee. Now, word has it that Kiva is prepping to make loans to people located in the United States. Kudos to Kiva - and hope they get some funding from AMEX members this week. Here is their blog to learn more and their site fo you to get involved and donate to end poverty. Looking forward to seeing an enthusiastic crowd at tomorrow's "From Mass to Grass" Word of Mouth conference. I'm excited about bringing some fresh grassroots stories to light through some amazing, made-in-Canada , word of mouth marketing successes. From big beer and airlines, to small labelling and 2.0 companies, to altruistic and profit-driven and some of the best B-to-C and B-to-B examples, if you are at all interested in the progressive side of marketing, media and research in Canada - get yourself down to watch and glean the insights. If you are already going and would like an up close and intimate with some of the speakers the night before drop me an email and I will tell you where we're hiding out over a few beers. Over the next couple of weeks, I look forward to providing an "7 Questions with" interview format with the majority of speakers and moderators who were at the event. See you there. Canada's must-see conference for the conversation marketplace, participation media, user generated content and new research worlds launches! 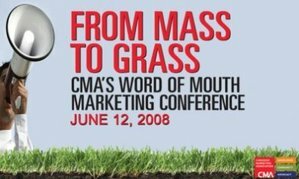 Check this out - The Canadian Marketing Association's "From Mass to Grass" returns again this year on June 12 in Toronto at a very cool summer-friendly venue (Pavilion at Ontario Place). Nowhere in Canada will you find a more entertaining and remarkable set of speakers dedicated to getting their companies noticed and talked about. Sure, there are other great conferences in Canada - mesh and ICE have their devoted followings, and for good reason. Whereas they deal with various facets of the new online and media environments in great depth, "From Mass to Grass" is designed to tie together these disciplines and shape insights and fully integrated strategies for progressive business people, marketers, entrepreneurs, agency people and media folk alike. If we don't all know it yet, you will after this conference - there is no more potent force to shaping consumer attitudes and changing customer behavior than word of mouth. It has its own orientation, its own tactics, style of communication, media, targeting, emphasis, measurement and success principles and deserves its place alongside the more traditional practices of advertising, promotion, PR, online and innovation. My personal mission is to ensure future rainmakers, firestarters, headline stealers and start uppers have an understanding of what's out there, why it works so well, the nitty-gritty of how to make it work for you and some of the watchouts. I promise you, you will drink from the "fire hose" of buzz-driven insight...at "From Mass to Grass". - Richard Bartrem, Westjet's VP Culture & Communications - our morning keynpote talking about "Caring Owners - Driving Word of Mouth Through Employee Empowerment and Enagagement"
- David Usher, award-winning musician and entertainment social media participant and resident expert in a segment called "Behind the Music"
- William Azaroff, VanCity - a not-for-profit example of what you can do when you say "yes we can", the triple bottom line success of VanCity credit union and a webby award nominee sponsored social network "Change Everything"
Andrea Wojnicki, Professor, Rotman School of Business (U of T) - WOMMA Advisory Board member and Harvard published author on "Social Hubs"
Sign up today or go to our Facebook page, become a fan and get a code for $50 off before May 1st...and of course, spread the word. David at PR Works "Psst...50 dollars off CMA Word of Mouth Conference...Pass It On"
Kate at My Name is Kate "From Mass to Grass Returns"
Mitch at Six Pixels of Separation "SPOS #88"
Great Facebook breakthrough posted at Radical Trust about "Music Soup by Jen Gould". People always ask me "who has really hit it big through Facebook and typically my response has been that Facebook has been an effective bullet in the grassroots shotgun but never the whole howitzer. In this case, a children's CD is pure social network breakthrough and I'm happy to evangelize about it. 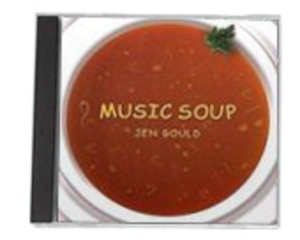 "Music Soup" is a great story of how an innocent outreach to 150 people on Facebook turns into grassroots sales of 6,000 CDs, all through word of mouth, turns into a 15,000 CD order turns into Juno nomination (Canada's version of the Grammies). Time and time again, I'm overwhelmed by how a small group of gifted people, acting passionately and zealously can change the fate of businesses and people. C'mon, Kawasaki, you know you want to believe in these influencers and not the same trumped up and flawed arguments for talking to the entire marketplace. To purchase the 17 songs of children's limericks, rhymes and smart verse, go here. For you kiddie iPoders, at least get the classic single "The Lemonade Song".